Copyright Susan Ward (cypresstech(at)uniserve.com); All Rights Reserved. 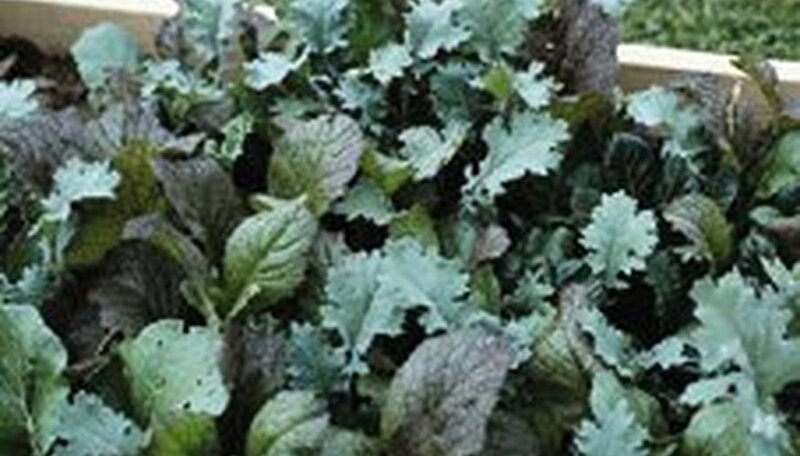 If you're craving fresh greens and horrifed by supermarket prices, why not grow your own? Nothing tastes fresher and sweeter than a spring salad just picked from your own windowsill or garden. For starters, you'll need some lettuce seed. Common green leaf lettuce is fine, but why limit yourself? A variety of lettuces makes a salad so much more appealing. There are four types of lettuce (looseleaf, cos (romaine), butterhead and crisphead), and there's no reason why you can't have all four types, although looseleaf lettuce is the easiest to grow. What about some Four Seasons (Mervielle des Quatre Saisons), with crisp, burgundy outer leaves and a tender, pink and white interior? Or some Freckles (Trout Back) Romaine, described as "exquisitely beautiful, lime green romaine... flecked with delicate, wine red markings" (The Cook's Garden, 1999). Red Sails, a fast growing red looseleaf variety is one of my favorites. Red Salad Bowl is another well-known red and green variety that's bolt resistant. Mesclun is a mix of salad greens available from the wild or the garden and different kinds of leaf and loose-headed lettuce. Originating in Provencal France, the traditional recipe calls for chervil, arugula, lettuce and endive in precise proportions, but nowadays Mesclun mixes include greens such as mustards, cresses and parsley as well as wild greens and all kinds of lettuce. The original idea was to make a salad that touches upon every taste and texture sensation: bitter, sweet, tangy, crunchy and silky. Mesclun is a treat for the eye as well as the tongue, with its colorful mix of textures. While many seed companies sell Mesclun mixes now, you might want to try to mix your own for a salad that most pleases your own palette. For a mild mix, combine familiar types of leaf lettuce with greens such as mizuna, purslane, mache and chervil. For a hotter, more peppery bite mix lettuces with cresses, Asian mustards, red kale, arugula, red and green chicories, or endive. Mesclun is amazingly easy to grow, as seeds germinate in cool weather, even as low as 40º F. Even if you live in an area with a long, cold winter, you can grow Mesclun practically all year round using growlights, a greenhouse, or season extenders such as cold frames and tunnels. And, as lettuce tolerates close planting, Mesclun doesn't necessarily take up much space. I start mine indoors around the first of February, sowing the seed directly into a pair of large shallow clay pots. The lettuce seeds sprout in about a week, although some of the greens are slower. Because you don't want the faster-sprouting lettuce to crowd out the greens, it's best to seed your greens separately in a different container, seed-tray, or windowbox. Outdoors, the best way to know when it's time to sow the seeds is to monitor the soil temperature. When the soil temperature at a depth of two to three inches is between 32 and 40º F, according to the National Garden Bureau, you can plant Mesclun seed as well as spinach, cabbage, carrots and radishes. As lettuces are shallow-rooted, the bed will need to be kept moist (but not soggy). Unchecked, rapid growth is the main requirement for tasty, tender greens; a constant supply of soil moisture is crucial. Letting the soil dry out will affect the taste. If you're sowing seed in rows, make a furrow 1/4 inch deep, sow the seed, and then cover the furrow. If you're broadcasting seed, simply scatter them, and then cover with about 1/4 inch of fine soil or compost. After germination, thin seedlings to a final plant stand of about an inch apart. The thinnings make fine salad additions, too. Seed only as much Mesclun as you're likely to eat in a week; successively sowing seed each week will ensure your garden produces only the amount of mature greens you will use for a week at harvest time. The best time to harvest Mesclun is early in the morning before the sun is high; heat causes wilting. Start harvesting when the greens are two inches long, never letting them get more than six inches tall; use scissors to snip them off just above the growing crowns (about one inch above the soil level). This is called the cut-and-come-again method because the crop will grow back; if you water and lightly fertilize after harvesting, the greens should be ready for harvest again soon. Once you've harvested it, rinse the greens in cool water to remove dust or dirt, examine them for weeds or insects, and drain on towels or pat dry. Mesclun is at its crispest and most flavorful when it's just harvested, so use it as soon as possible. (If you use a salad spinner to dry the greens, this is especially important, as spindrying will bruise the leaves, causing them to go limp quickly.) If you do need to store Mesclun, wrap the leaves gently in slightly damp towels, seal in a plastic bag and place in the refrigerator, where they should stay fresh for several days. Harvested Mesclun that has become slightly wilted can be revived by placing in cool water; crisping will take ten to fifteen minutes. One of the glories of growing Mesclun is the incomparable taste; a salad fresh picked from your own garden is head and shoulders above anything you could pick up at the market. Like many gardeners, I usually serve Mesclun simply with a bit of light vinaigrette dressing. Some people like to add edible flowers and/or herbs to their salads, and others still like to stirfry Mesclun in butter or hot oil and add it to vegetable dishes or pastas. Chicory greens are another common ingredient in Mesclun seed mixes; according to The National Garden Bureau,100 grams contains only 20 calories but has 4,000 international units of Vitamin A, 420 milligrams of potassium and 22 milligrams of ascorbic acid. 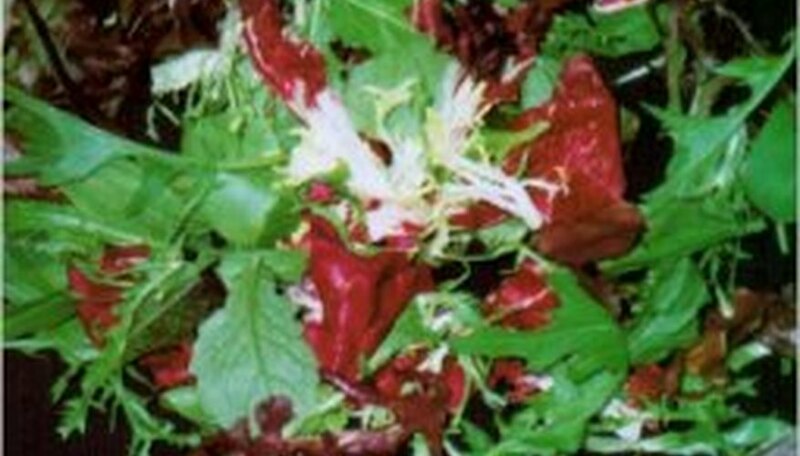 Mesclun greens also contain appreciable amounts of calcium and phosphorus. Lastly, a Mesclun-based spring salad is just plain fun. There are very few salads that can so fully exercise the taste buds and provide the eye with such a visual feast, and few dishes that give gourmands such opportunity to play with different flavors and textures. Blend your salad in the kitchen or at the table and savor the true meaning of "fresh greens". Hamilton, George W. "Mesclun, A Blend of Salad Greens". Network Publications Inc. 1999. Lawton, Barbara Perry. "Year of the Mesclun". National Garden Bureau, Inc. 1998. Ogden, Ellen & Shepherd. "The Cook's Garden". 1999. Rindels, Sherry. "1997 - Year of the Mesclun". Horticulture and Home Pest News. Iowa State University. 1997.